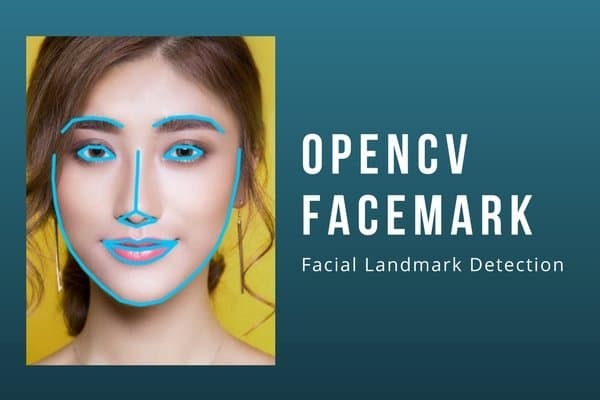 In this tutorial, we will learn about facial landmark detection using OpenCV with no external dependencies. I have written several posts about Facial Landmark Detection and its applications. You can use landmark detection for face morphing, face averaging and face swapping. Until now, we had used the landmark detection that comes with Dlib. It works great, but wouldn’t it be nice if we did not have to depend on any external library. Well, the wait is over. Almost! Lack of trained models: Out of the three algorithms implemented for landmark detection, I could find only one trained model that works. This is not very hard to fix. In the worst case, we will try our own model and make it available for people to use. Because of the two limitations above, this post will be updated a few times in the next few months. FacemarkAAM: This implementation uses an Active Appearance Model (AAM) and is based on an the paper titled “Optimization problems for fast AAM fitting in-the-wild” by G. Tzimiropoulos and M. Pantic, published in ICCV 2013. FacemarkLBF: This implementation is based a paper titled “Face alignment at 3000 fps via regressing local binary features” by S. Ren published in CVPR 2014. The three implementations follow similar patterns even though, at the time of writing this post, the FacemarkKazemi class does not seem to be derived from the base Facemark class, while the other two are. Even though the Facemark API consists of three different implementations, a trained model is available for only FacemarkLBF. This post will be updated in future after we train our own model based on public datasets. lbfmodel.yaml (Forked Repo) ( in case the above link is taken down ). In this section, we will share the code for real-time facial landmark detection. This post will be updated when Python bindings are supported for the Facemark API. The code is shared here. You can also download the code using the link below. The steps involved in calling the Facemark API for real-time landmark detection are listed with references to the code below. Load face detector: All facial landmark detection algorithms take as input a cropped facial image. Therefore, our first step is to detect all faces in the image, and pass those face rectangles to the landmark detector. 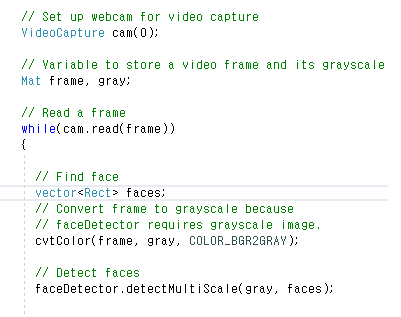 We load OpenCV’s HAAR face detector (haarcascade_frontalface_alt2.xml) in line 14. Create Facemark Instance : In line 17 we create an instance of the Facemark class. It is wrapped inside OpenCV smart pointer (PTR) so you do not have to worry about memory management. Load landmark detector: Next, we load the landmark detector (lbfmodel.yaml) in line 20. This landmark detector was trained on a few thousand images of facial images and corresponding landmarks. Public datasets of facial images with annotated landmarks can be found here. Capture frames from webcam: The next step is to grab a video frame and process it. Line 23 sets up the video capture from the webcam connected to your machine. You can change it to read a video file instead by replacing line 23 with the code below. We then continuously grab frames from the video ( line 29 ) until ESC is pressed ( line 62 ). Detect faces: We run the face detector on every frame of the video in lines 33-39. The output of a face detector is a vector of rectangles that contain one or more faces in the image. Run facial landmark detector: We pass the original image and the detected face rectangles to the facial landmark detector in line 48. For every face, we get 68 landmarks which are stored in a vector of points. Because there can be multiple faces in a frame, we have to pass a vector of vector of points to store the landmarks ( see line 45 ). Draw landmarks: Once we have obtained the landmarks, we can draw them on the frame for display. The code for drawing is inside drawLandmarks.hpp and is not shared here to keep things clean. // faceDetector requires grayscale image. // use a vector of vector of points. Here is a video demo of the above code. Thank you, Satya, for another wonderful post. I wonder if there is any comparison (accuracy/performance) between these algorithms and the one in Dlib? An OpenCV-based landmark detection will at least save some time on converting the cv::Mat to dlib::array2d. Thanks. FacemarkKazemi is the exact same algorithm as Dlib’s, and if trained on the same data, the accuracy should be close. LBF and Kazemi papers both appeared in 2014 and have very close error measures on the 68-point dataset ( Kazemi : 0.064, LBF : 0.0632). This is assuming the implementation is close to the original author’s implementation. What about the performance? OpenCV-based implementation is expected to be faster? It does make sense because the algorithm is the same (FacemarkKazemi) and so one can write a converter that converts one model to the other. Although, I suspect, it would be just simpler to train a model from scratch which I plan to do soon. Well, this is a good new, and I am very thankful of it. Compiling Dlib takes a bit of time, but nothing compared to compiling OpenCV. Also, it is only a one time effort, and after that you can simply link to the libraries. Thanks a lot für this excellent post once again. I have a question about landmark model. Do all algorithms use the same 68 landmark model with the same indexes. What is the best refernece on that? Thanks. You can train a landmark detector with any number of points. But most people use standard public datasets for training and therefore the order of the points is the same for all the models. Thank you, Doctor Satya, for your fabulous post. (in all of source) I got the error message as above, could you help me? Is your image grayscale by any chance? the preprocess for grayscale is already put on your code. right? In order to debug this, please try and check the frame is read properly from the camera. Please let us know if it reads the frame from camera properly and still shows the error. Thanks! Face recognition is a whole different ball game. Facemark will not help you in that. However, it can be used as a preprocessing step for aligning faces to make recognition better. See this library, it’s use a landmark dataset to generate a face code, an array with 128 points, which is a unique one-sided code. I got everything up and running on Window and MacOS. But I fail building OpenCV for iOS with contribution modules that also include the face module. build_framework.py –opencv ../.. –contrib ../../../opencv_contrib ./build. Everything links perfectly except for the functions from the face module. Is there any restriction for the platform for this face module? I have not tried it on iOS, so I am not sure why it does not work. Thx Satya, your’re great genious, you help us so much! Thanks for writing such informative articles. I was trying to run this code but Could you please tell me in which module “opencv2/face.hpp” file is present in opencv? How did you compile the files? What command did you use? Hello Doctor. I am honored to read your article. According to your code, I successfully implemented the facial landmark detection, but the accuracy of feature points on the contour of the face is not good. Is there any way to improve it? In addition, how do I train my own model? The only way to improve this model will be to train your own model. We will write an article about it soon. Thank you very much for your reply and look forward to learning your new article. Thanks for the great article. I could able to test the landmarks. As a next step, I would like to extend this to recognise faces. Could you please write an article for that as well? 2) When a new image is given, compare new image’s face landmarks against the stored ones and say if that face can be recognised or not. For comparison, some kind of neighbour algorithm can be used. I was able to do this way in Python. But I am clueless in how can I do this kind of comparison in Android. Given that I would like to develop an android app for face recognition, Is the above approach is correct or any other better approaches available? Could you give any pointers? we can use face landmarks for head pose estimation depending on the distance between points ? For example, if (((landmarks.x + landmarks.x) / 2) – landmarks.x) > 0 so the face turned left, etc. Support for C# is not there yet (for FacemarkLBF, Kazemi and AAM Algorithms). Stay in touch with OpenCV Tutorials and the upcoming releases for that. How to train a custom landmark model? We are still working on that post. Will post soon. I am very much looking forward to your post on training a custom-made landmark model. While it is still in the works, could you give some pointers to where we could find help in the documentation? This is surely a great article for the beginners. I am facing the following problem while running the code. Can you tell the reason behind it please? Please check your lbfmodel.yaml file, or else download the one from here: https://github.com/spmallick/GSOC2017/blob/master/data/lbfmodel.yaml and let us know if it works. i need a “facial component detector” which i can use it to store pixel’s information(pixels of components like: lip, mouth …) and separate facial components. Can i use this land mark detectors above in your topic to do so? if yes, i’ll begin to learn how to work with, if no, could you guide me what can i do? My best regards…Thanks in advance…! Yes, you can use the landmark detected to find contours around facial components ( e.g. eye / nose / mouth etc. ). You can then use those contours to create binary masks for each component. I am not quite sure. Have you tried OpenCV 3.4.1? When will be Python bindings are available for the Facemark API. Are you working on it or anyone else? However, the current fix, while it works is not satisfactory. So I am not sure when they will release it. Looks like you need to compile OpenCV with opencv_contrib. compilator can’t find bodies of those functions , where they describe? You need to install OpenCV with opencv_contrib. I keep getting a “Exception thrown: read access violation. _Pnext was 0x7” error. This happens when I try load the “lbfmodel.yaml” model. It appears to be in the _Container_base12::_Orphan_all() function. Do you have any idea what could be causing this? So I now know that the problem is the line”facemark->loadModel(“lbfmodel.yaml”);”. When I try load the model I get the error mentioned above. Is the model possibly in the wrong format? When I click download on github it opens the model data and then I right click save as. Is this the incorrect way to download the lbfmodel? If so how should I do it? Thank you for your time! I have not seen this problem before. Which version of OpenCV are you using? Ptr facemark = FacemarkLBF::create();”. So its actually a problem with the pointer declaration. I’m currently using visual studio 2015. I’m going to update to 2017 and see if that is maybe the problem. I am assuming it is 3.4.2. Please keep us informed how it goes so everybody can benefit. Thanks. Thanks. I have to look into this. Hello Dr. Satya, is there a way I can store the landmark points found on each frame separately, I did try accessing the x and y members of the Point2f type vector but i got the error, “has no member function x”. Any help would be appreciated. my program spews this error everytime I try to load the landmark model..I tried updating the .yaml file a few times but no change. I looked into the implementation of loadmodel and the file name string is correct . Any idea what may be going wrong? Unhandled exception at 0x00007FF8AB2850D8 in FacialLandmarkDetection.exe: Microsoft C++ exception: cv::Exception at memory location 0x000000643F2FEAD0.